In a press release today, Morgan Creek Digital Assets publicized a bet that the Bitwise index fund of cryptocurrencies—including Bitcoin and altcoins—would outperform the S&P 500, a capitalization-weighted index of 500 of the largest U.S. publicly traded companies. “…the combination of a bubble, a Ponzi scheme, and an environmental disaster,” according to CNBC. Now the naysayers have an opportunity to speak with their wallets. The fund would have exposure to 75 percent of the cryptocurrency market and would churn monthly—changing with each coin’s market capitalization—to represent the changing proportions of the market. For those interested in the convenience of a managed portfolio, the fund is also offered to U.S. accredited investors with a minimum investment of $50 thousand. Something to keep in mind: it is possible that this bet is a marketing stunt used to drum up interest for the firm’s crypto fund. Fewer than 30% of its current issuance held by the protocol’s foundation or related operating business. According to the MDMA, this is to prevent undue centralization that may “potentially threaten” the fundamental value of a decentralized network, ruling out coins such as Ripple (XRP), Stellar Lumens (XLM), and TRON (TRX). 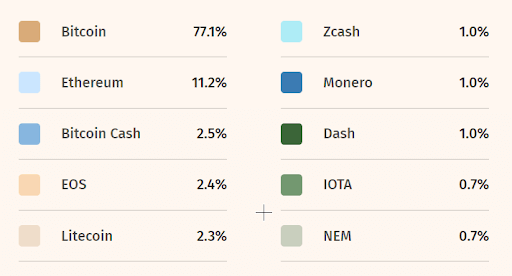 Although Stellar Lumens (XLM) does intend to give out 95 percent of its holdings, it has only given out a tiny fraction thus far. Trades on two or more exchanges, with no more than 90 percent of combined 30-day trailing trading volume conducted on any single exchange. This requirement exists to ensure that there is sufficient liquidity for buying and selling, and to remove a point of failure should a major exchange fail. Allows for air-gapped cold storage, including offline wallet generation and offline transaction signing. This rule allows for the secure storage of any assets, mitigating losses from potential hacks. The challenge is structured as a ‘Buffet Bet’ 2.0, a nod to Warren Buffet’s bet of $1 million that S&P index funds would outperform a selection of actively managed hedge funds. Warren Buffet won the bet handily, with the S&P 500 returning 7.1 percent interest compounded annually, compared to 2.2 percent with the selection of hedge funds. Since its inception, the S&P500 averaged returns of 10 percent annually from 1920 through 2016. If dividends from these stocks were reinvested, it would be substantially higher. Whether cryptocurrency can outperform the solid returns of the equities market is still uncertain. Other than the challenge, the press release did not mention any other details surrounding the bet. The post Cryptocurrency Skeptics Challenged: $1 Million Bet Crypto Outperforms S&P 500 appeared first on CryptoSlate.